All of us have been channel surfing and ended up tuning into a police chase show. We have become glued to the screen as we watch some madman behind the wheel of a car doing whatever it takes to avoid being captured by the law. Crazy police car chase shows are the O.G.s of reality TV programming, and they appeal to action junkies of all ages. 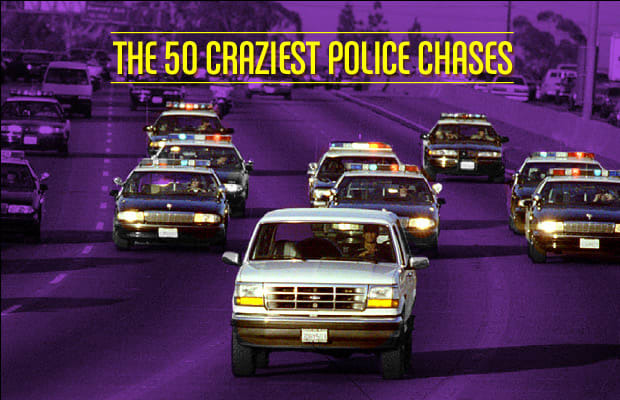 To commemorate the timeless art of getting away from the cops, we compiled a list of 50 of the craziest police car chases that have gone down in the last two decades. From Corvettes to stretch limos, to tanks and even one well-known white Ford Bronco, if you can conceive of it in a chase with police, it's probably on this list. So go ahead and check out this collection of wild road maneuvers, catastrophic crashes, and insane shootouts. If you get the urge to hotwire a car, we urge you to take it out on a Grand Theft Auto video game session. We wouldn't want to see you end up in a cell with some of these lawless lunatics.